Happiness can be a complex and somewhat ephemeral subject to study, and with so many dimensions to a person's life and experience, it's important to focus attention on specific areas to properly gauge how happy women were in their multifaceted worlds. As part of the POPSUGAR Insights "Find Your Happy" study, we surveyed women to determine how happy they were in various areas of their lives and then looked at the top two box summary (very happy and somewhat happy) to rank where they are happiest. Overall, the sometimes challenging role of motherhood is what delivers the highest state of happiness. 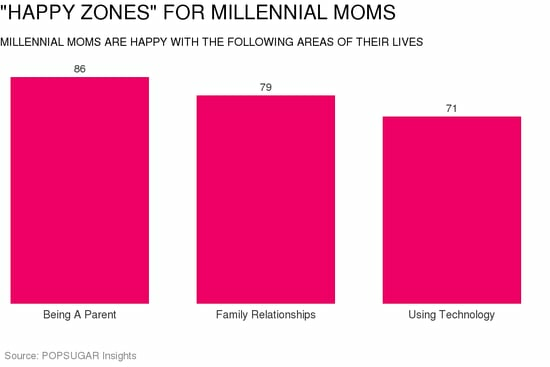 Eighty-six percent of moms said that they are happiest in their role as a parent, with over 61% of women stating that they were "very happy" with parenthood. Beyond parenthood, it's connections and passions that drive happiness for women. Seventy-three percent of women overall said that their family relationships make them happiest. This was especially true of married women (81%), millennial moms (79%) and working women (77%). Over 71% of women cited their hobbies and activities as the area of their lives that creates the most happiness. Proving the important role that technology plays in keeping us connected, informed, and entertained, 70% of women cited the ability to use technology to improve their lives as what makes them happiest. This notion was especially espoused by students (74%) and Hispanics (79%), but was generally high among all age ranges, life stages, and ethnicities.